Last Splash is the second album by American indie rock band The Breeders, released on August 31, 1993. Originally formed as a side project for Pixies bassist Kim Deal, The Breeders quickly became her primary recording outlet. Last Splash peaked at number 33 on the Billboard 200 albums chart, and by June 1994, the album had been certified platinum by the Recording Industry Association of America (RIAA) for shipments in excess of one million units. The title of the album is taken from a lyric from its lead single, "Cannonball". The video for "Cannonball" was directed by Spike Jonze and Kim Gordon, and the video for the album's second single "Divine Hammer" was directed by Jonze, Gordon and Richard Kern. A looped guitar sample of "S.O.S." was used by the English electronic music band The Prodigy in their 1996 hit single "Firestarter". A sample from "I Just Wanna Get Along" was used in another track by The Prodigy called "World's on Fire" from the Invaders Must Die album. In 2003, Pitchfork listed the album at number 64 on their list of The Top 100 Albums of the 1990s. On May 13, 2013, 4AD released LSXX, a deluxe 20th anniversary version of the album. All tracks written by Kim Deal, except where noted. There are two versions of LSXX: a 3-CD package and a 7-disc vinyl set. The CD and vinyl formats have the same track listings. The track listing below is for the 3-CD set. All songs are by Kim Deal except where noted. The first disc contains the original release track listing. Kelley Deal – guitar, Kenmore 12-stitch, vocals, lead vocals on "I Just Wanna Get Along"
Jim MacPherson – drums, bass on "Roi"
Josephine Wiggs – bass guitar, double bass, vocals, cello, drums on "Roi"
Daniel Presley – engineering on "Divine Hammer"
^ a b Zoladz, Lindsay (May 15, 2013). "The Breeders: LSXX". Pitchfork. Retrieved October 30, 2013. ^ "Breeders, The – No Aloha". Discogs. Retrieved 22 May 2013. ^ Phares, Heather. "Last Splash – The Breeders". AllMusic. Retrieved August 20, 2015. ^ Dolan, Jon (December 2008 – January 2009). "The Breeders: Last Splash". Blender (76): 86. Archived from the original on April 20, 2009. Retrieved October 19, 2015. ^ Kot, Greg (September 10, 1993). "Veil Of Noise". Chicago Tribune. Retrieved October 24, 2015. ^ Frost, Deborah (August 27, 1993). "The Breeders' Last Splash". Entertainment Weekly. Retrieved August 20, 2015. ^ Mackay, Emily (August 12, 2013). "20 Years On: The Breeders' Last Splash Revisited". The Quietus. Retrieved August 20, 2015. ^ Rust, Ned (October 14, 1993). "The Breeders: Last Splash". Rolling Stone. Archived from the original on February 13, 2009. Retrieved August 20, 2015. ^ Wolk, Douglas (2004). "The Breeders". In Brackett, Nathan; Hoard, Christian. The New Rolling Stone Album Guide (4th ed.). Simon & Schuster. p. 104. ISBN 0-7432-0169-8. ^ Sutton, Terri (May 15, 2013). "The Breeders, 'Last Splash' (4AD/Elektra)". Spin. Retrieved May 15, 2013. ^ Christgau, Robert (September 28, 1993). "Consumer Guide". The Village Voice. Retrieved August 20, 2015. ^ "Staff Lists: Top 100 Albums of the 1990s". Pitchfork. November 17, 2003. Retrieved May 5, 2016. ^ "The Breeders: Out Now: The Breeders – LSXX". 4AD. Retrieved May 5, 2016. ^ "The Breeders – Last Splash". australian-charts.com. Hung Medien. Retrieved December 28, 2012. ^ "RPM 100 – Albums (CD's & Cassettes)" (PDF). RPM. Library and Archives Canada. December 4, 1993. Retrieved December 28, 2012. ^ a b "Discografie The Breeders". dutchcharts.nl (in Dutch). Hung Medien. Retrieved December 28, 2012. ^ "Album – The Breeders, Last Splash" (in German). Media Control. Retrieved December 28, 2012. ^ "The Breeders – Last Splash". swedishcharts.com. Hung Medien. Retrieved December 28, 2012. ^ a b "Official Charts > Breeders". The Official Charts Company. Retrieved June 19, 2017. ^ a b c d "Last Splash – The Breeders: Awards". AllMusic. Rovi Corporation. Archived from the original on September 23, 2010. Retrieved December 28, 2012. ^ "The Breeders – Last Splash". charts.org.nz. Hung Medien. Retrieved December 28, 2012. ^ "The Breeders – Cannonball". lescharts.com (in French). Hung Medien. Retrieved December 28, 2012. ^ "Gold and Platinum Search". Music Canada. Retrieved December 28, 2012. 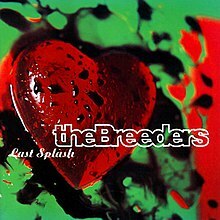 ^ "British album certifications – The Breeders – Last Splash". British Phonographic Industry. Select albums in the Format field. Select Silver in the Certification field. Type Last Splash in the "Search BPI Awards" field and then press Enter. ^ "French album certifications – The Breeders – Last Splash" (in French). Syndicat National de l'Édition Phonographique. ^ "Gold & Platinum Searchable Database". Recording Industry Association of America. Retrieved December 28, 2012. This page was last edited on 6 January 2019, at 12:47 (UTC).